The Environmental Protection Agency (EPA) refers to Electronic Waste as "electronic products that are discarded by consumers." That is somewhat vague, so think of E-Waste as the electronics version of what you’d find in the kitchen trash can. Only it’s a toxic mess. E-Waste is the disposal of electronics products. Improper disposal affects human and environmental health because many of these products contain toxic substances. 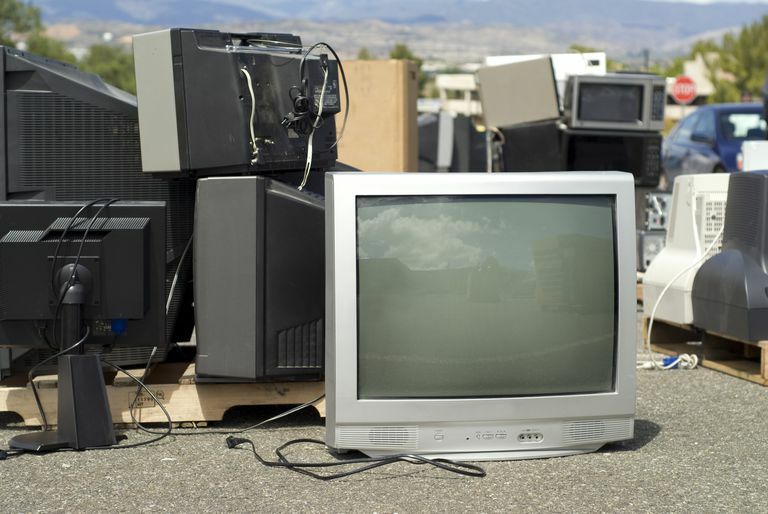 Improper disposal could be dumping your old analog TV in a field by your house, in a landfill, parking lot or a recycling manufacturer illegally shipping it overseas. The key to remember is that improper disposal could cause a harmful impact that affects your backyard. The impact of E-Waste regarding televisions sped up by the digital transition because of the many individuals and businesses that replaced analog TVs with digital models. Lead is the primary substance of concern because of all the analog TVs that are replaced due to digital TV. It’s found primarily in cathode ray tube (CRT) TVs, which typically contain anywhere from four to eight pounds of lead, which is mostly found in the tube. Mercury is not exclusive to thermometers as it's also found in flat panels TVs. This is because some of the lighting used contains mercury, which is “toxic in very low doses, and causes brain and kidney damage” according to Take Back My TV. Lighting in flat panels has improved with the development of cold cathode fluorescent lamp (CCFLs) and light-emitting diode (LED), which don't use mercury. Cadmium is found in the phosphor coating that lines the inside of many CRT screens. The EPA started regulating cadmium in 1974 with the Safe Drinking Water Act. It‘s a potentially serious substance to long-term health. The EPA says that cadmium can cause kidney, liver, bone and blood damage if exposed to high levels over a long period of time. Cadmium can penetrate our food source by moving through soil layers and being absorbed by leafy vegetables, root crops, cereals and grains, according to the Agency for Toxic Substances and Disease Registry. Brominated flame retardants (BFRs) are known to cause damage to hormone and reproductive systems. They’re found in plastics, like protective cases, circuit boards, and cables with a purpose of providing fire protection. The Silicon Valley Toxics Coalition (SVTC) reports that BFRs “impair attention, learning, memory and behavior in laboratory animals.” The SVTC says that BFRs have been discovered in marine mammals, fish and bird eggs as well as human milk, serum and adipose tissue. The Georgia Department of Human Resources, Division of Public Health issued a statement promoting the reuse and recycling of analog televisions due to the digital transition. This health concern isn’t limited to Georgia. It would be nice if every business that promises to responsibly recycle a TV abides by the law, but that isn't the case. Possibly the best website to find a reputable recycling organization is the EPA's eCycling website, which lists manufacturer and non-profit recycling programs affecting consumer industry.